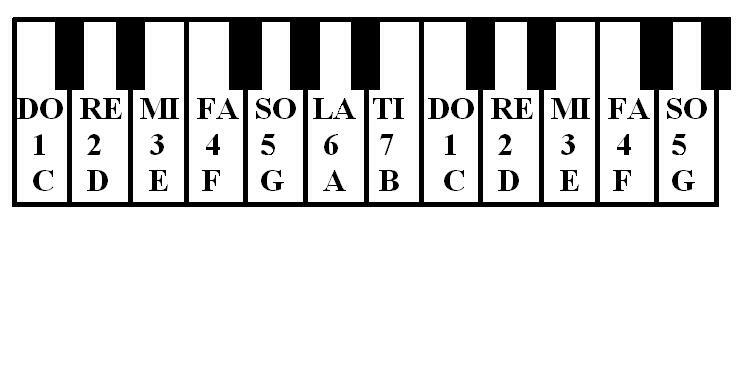 These simple songs below are easy to play by ear using the chart below in the Key of C. The Key of C is the simplest key in which to play because all the notes are white keys. (However, these same numbers can be used in any key once one knows the appropriate scale in that key. ) Read just the RED with the chart under it for FAST TRACK. NOTE: 1 and 8 are the same notes but 8 is an octave higher. RIGHT HAND: Thumb on 1; pointer on 2; middle finger on 3; ring finger on 4; pinkie on 5. LEFT HAND: Thumb on 5; pointer on 4; middle finger on 3; ring finger on 2; pinkie on 1. NOTE ON TIMING No timing is notated in these songs, but most children or at least the parents should know some of these classic or traditional songs. The numbers played will produce the MELODY of the song. Once the student learns the melody, HARMONY may be added with the left hand. The chords are usually played with the LEFT HAND while the MELODY is usually played with the RIGHT HAND, but this can be reversed for variation. TONIC CHORD = 1+3+5 played together. In the Key of C, the TONIC is “c” and TONIC CHORD is the C chord: c+e+g. A memory aid for this is Cows Eat Grass. The TONIC is always the base TONE (1) in a KEY. To simplify this, and to play without changing hand positions, we can play just 2 + 5. It is rather easy for children to go back and forth between a FIFTH (1 + 5) and a SECOND (4 + 5) in the Key of C.
Suggestion: Print out on bright paper with “landscape” printing orientation for children.